Ability to detect and select the coins without miscounting. The diameter of centrifugal rotary disk is above 17 cm. Max. capacity is for filling 200 coins (Coin Diameter: 26mm). 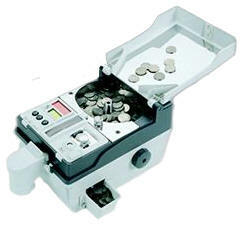 The counting speed per minute is 600 coins (Coin Diameter: 26mm). The counting speed will vary according to different coin. The way of coin counting is by high-speed centrifugal rotation. Besides, the Electronic Board is designed with special protective device. It can effectively protect the circuit of electric board. It is suitable for counting the contemporary coins and it can be adjusted for future coins (The limitation of coin: Diameter: 20mm-30mm. Thickness: 1.5mm~3.0mm). The way of counting is by electronic sensor. It is designed with 2-row LED display. Besides, coin number with 10, 20, 40, 50, 100, 200, 400, 500 can be set individually and repeatedly according to the requirement. Coin can be selected and counted from big to small. It can detect and find out the different coin or misshape coin, even the difference is 0.5mm. With special rotary button to prevent coin deformation when it is blocked. When the coin is blocked, it will auto-rotate. If coin rotation is over two times, the machine will stop operation. Counting Way Settable for various circulative fixed nos. Please always close the dust cover when it is not in use to keep it from dust. When you are using the machine, please plug in and open the dust cover. 1. To release the knob. 2. Push the knob outward. 3. Place the coin into the groove. 4. Push the knob inward until making sure to touch the coin. 5. To turn the knob until the coin is fixed tightly. Adjust the height of coin passage. When the knob for adjusting the thickness of coin is turned clock-wisely, the gap will be increased. The ideal height will be allowed the passing through of one coin but coin can not be blocked. When this knob ids turned counter-clock wisely, the gap will be reduced. If the gap is too small, the coin may not pass through. Button for setting coin number: Set the coin number that you are going to count. Nine different coin number 10, 20, 40, 50, 100, 200, 400, 500 and 00 can be set individually and repeatedly according to the different requirement. Button for erasing the counting memory: When it is stopped counting, please always push this button to erase the counting to "0". Button for starting/turning off operation: Push this button for starting operation. Push this button again to stop operation. This machine is with the function of auto-detecting function. If the coins are different or deformed, it will be sent out without counting and return to the tank. The tank can be disassembled easily. The guiding channel is detachable. When the coin is counted, attach the guiding channel to its position in order to collect the coin easily. You can use any container or bag as you wish to collect the coin. When it is not in use or it is packed into the carton, detaching the guiding channel can reduce the volume or storing space. When the coin is blocked, it will auto-rotate. If the coin rotation is over two times, the machine will stop operation. Under the circumstances, the user the knob clock wisely, it can let the coin come out. Turn the knob counter-clock wisely, it can let the coin return to its original position.